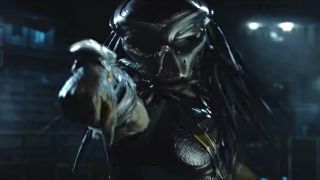 The first trailer for The Predator has arrived, and it looks like Earth is going to have its hands full when everyone's favorite intergalactic hunter crash lands and decides to start collecting skulls (you know, again). But is there more going on here than meets the eye? First, take a look for yourself and see what you think before we get into the weeds. "I think they're attempting hybridization." But what if we're interpreting that line all wrong? What if Munn isn't referring to the Predator attempting to make itself into a hybrid, but is talking about us making our own hybrid Predators? Notice in the set pic that those Predators aren't wearing their typical alien armor - it's more chunky and human-looking, with camouflage patterns painted on. Kinda sounds like what you'd dress a Predator-human hybrid in, don't you think? And The Predator is clearly aiming to connect the dots of the Predator mythos - in this movie, Jake Busey plays the son of Gary Busey's character from Predator 2, a man who wanted to capture and study the extraterrestrial. Meanwhile, Predators revealed that Arnold Schwarzenegger's report about what really happened in '87 is known to some outside of himself and his superiors. Now, you might be thinking that Munn's very next words from the trailer wouldn't fit this theory. "They're upgrading on every planet they visit," she says ominously. But there's a significant pause between lines, and we know trailers can and are often edited in such a way as to trick us (see: pretty much any Star Wars trailer of the past three years). And besides, this doesn't make what she's saying necessarily untrue, just possibly taken out of context. Maybe these are two entirely separate conversations, and the "upgrading" has nothing to do with genetic modification. Or maybe I'm wrong and Munn is referring to the new Predator as the hybrid, and the Predators seen in the set pic are purebloods who are simply stripped of their gear and team up with humans to stop what they see as an abomination. That would fit with both director Shane Black's penchant for mismatched buddy movies and play on the idea that Predators are ruthless and deadly, but also noble and honor-driven. We may not know the whole truth just yet, but it's clear there's more going on here than the initial trailer suggests. I look forward to finding out more come September 14.